When the calendar turns to spring, my mind wanders from braising to grilling and I tend to stop day-dreaming about polenta all together. But after this dinner, I think that’s going to change. 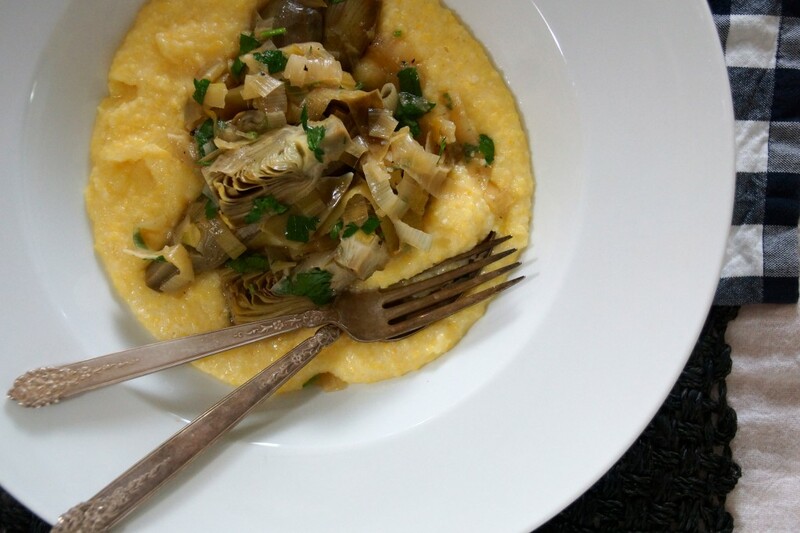 Spring evenings are actually an ideal time for a bowl of not too heavy polenta with saucy, braised artichokes. The weather’s nice enough to eat outside, but come dusk, the air gets a bit brisk and a warm bowl of polenta is just what you need to remain al fresco. Or scratch that theory. How’s this for the perfect spring braising/polenta scenario? Lunch on an incredibly gloomy, gray, drizzly Saturday afternoon. It’s the kind of day when you eat lunch at the kitchen table and it ends up lasting for hours. You light a candle, sip red wine, and let yourself become hypnotized by the pitter-patter of falling rain. Dessert after a lunch like this? Only the most decadent thing imaginable–a nice long nap. Whatever the circumstances, I can find a way to make this meal work and you should too. It’s simple, delicious, and the flavors and textures are supremely comforting. The artichokes aren’t fussed with much, just cooked in white wine with leeks and garlic, brightened up with a handful of parsley and a squeeze of lemon. The polenta is kept soft and loose, with a spoonful of Mascarpone cheese added for a touch of richness. 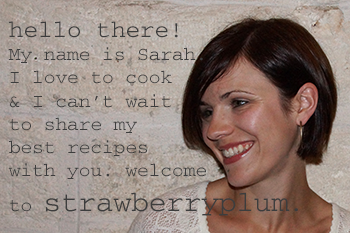 Cue the raindrops, let’s cook! Trim a bunch of baby artichokes. It breaks my heart a little every time I do it, but it pays off in the final dish to be ruthless. Pull off the outer leaves, cut off the top third, and trim the bottom off the stem. Cut them in half and if there’s a choke, use a tiny spoon to scoop it out. Cut them in half again and toss them in a bowl of lemon water to keep them from turning black while you prep the rest of the ingredients. Chop a leek and slice a few cloves of garlic. Sauté them in butter and olive oil until the leeks start to wilt and the garlic is slightly golden. Add the artichokes and cook for a couple of minutes before adding a splash of white wine. Let the wine cook off, then add chicken or vegetable stock and simmer until the artichokes are completely tender. When the artichokes are done, sprinkle with parsley and add a squeeze of lemon juice. 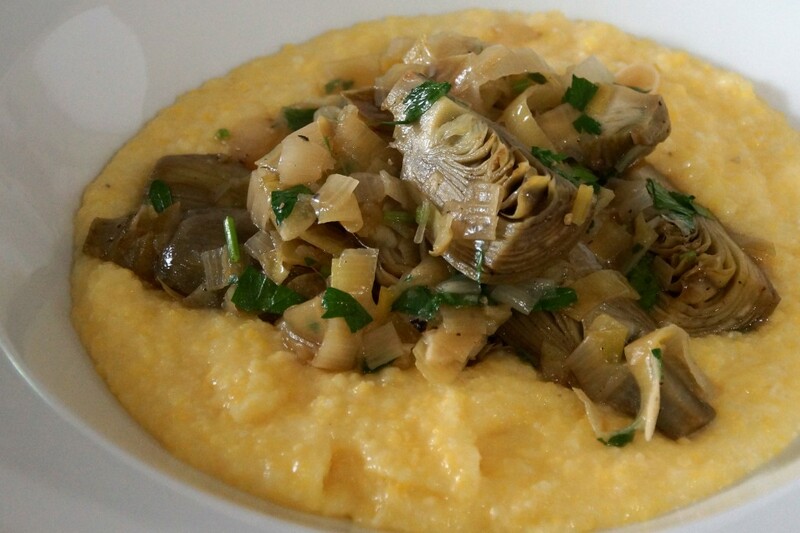 Serve the braised artichokes over a bowl of creamy polenta and settle in for a long lunch. If you're not a fan of polenta, the braised artichokes would be lovely served on their own as a side dish or over crostini for an appetizer. Trim the artichokes. Snap off the tough outer leaves until you reach pale green inner leaves. Cut off the top ⅓ of each chop and trim off the brown end of the stem. Cut each artichoke in half and scrape out the choke (if there is one) and cut in half again. Place the trimmed artichoke in a bowl of cold water with lemon juice to prevent browning while you finish trimming the rest of the artichokes. Heat about 1 Tbsp. each of butter and olive oil in a large, lidded sauté pan or Dutch oven over medium-high heat. Add the leeks and garlic and sauté until the leeks begin to wilt and the garlic is fragrant, about 5 minutes. Add the quartered artichokes, season with a little salt and briefly sauté, about 1 minute. Add the wine and allow it to simmer off, about 1 minute. Add the chicken or vegetable stock, tuck in the bay leaves, bring to a boil, then reduce heat to maintain a gentle simmer. Partially cover the pan and allow to cook until the artichokes are completely tender, about 45 minutes. While the artichokes cook, make the polenta. Bring the water (if using water, add a bit of salt and a drizzle of olive oil) or stock to a boil and slowly whisk in the polenta. Lower the heat to maintain a very low perk and stir frequently until the polenta is soft, about 30 minutes. If the pan seems to dry, add more water or stock. To finish, season with salt and pepper and stir in about 2 Tbsp. of Mascarpone cheese. When the artichokes are tender, remove the bay leaves and and season as needed with salt, pepper, and a touch of lemon juice. Remove from heat, and stir in the parsley. Divide the polenta between warm bowls and spoon the artichokes and braising liquid over the top. This looks delicious! You must have some Friulian blood in your veins. Indeed! Actually, the artichokes tasted a lot like how you used to make them in the pressure cooker.